As the official platinum bullion of the United States, the Platinum Eagles are a beautiful and valuable addition to any portfolio and collection. 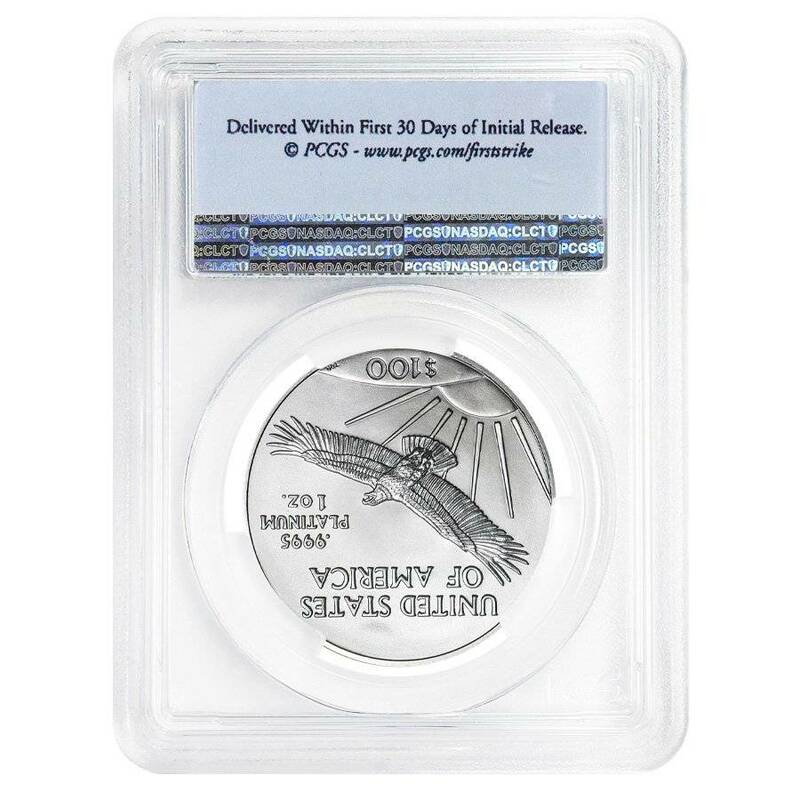 This 2019 Platinum American Eagle is fully backed by the U.S. government and is recognized around the world for its platinum purity, visual appeal, and its American symbolism. 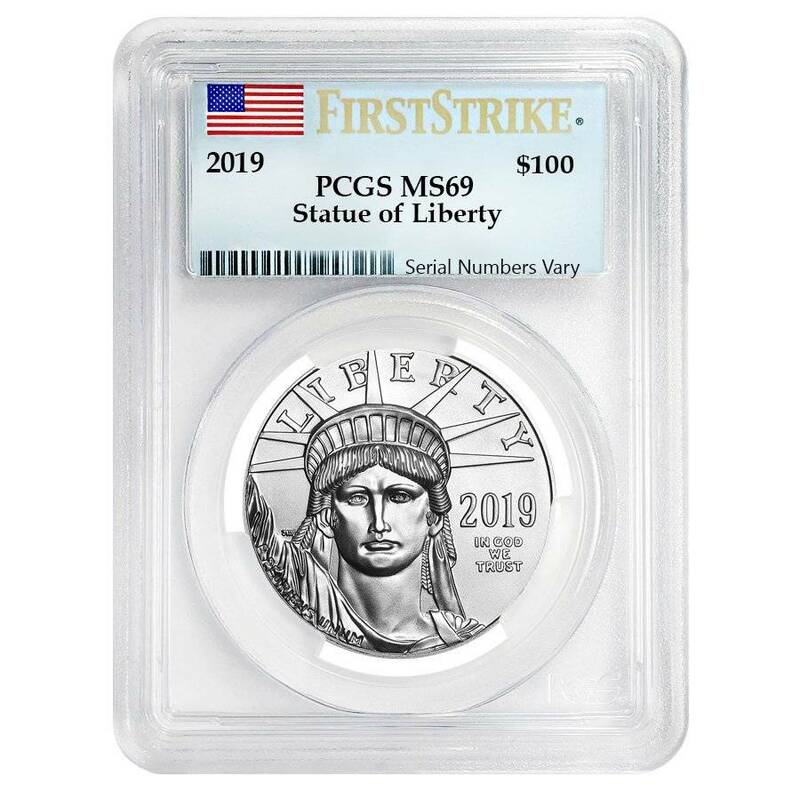 This coin is graded by PCGS with a grade of MS 69 - which certifies it as nearly perfect, making it even more appealing for collectors and investors alike. 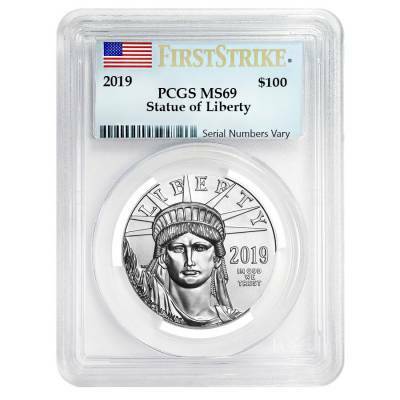 The First Strike label certifies that this was one of the few coins released within the first 30 days of the coin's issue. The obverse features Lady Liberty looking out, with “LIBERTY” inscribed above her, with additional inscriptions of the year, “IN GOD WE TRUST, and “E PLURIBUS UNUM” The reverse displays the heraldic American eagle soaring in front of a sunrise with "United States of America" inscribed above. The weight, purity and $100 face value are also shown. Bullion Exchanges is proud to carry 2019 Platinum American Eagle coins along with many other popular coins from the U.S. Mint. Add this beautiful coin to your collection today, and it will be carefully wrapped, packaged, and delivered to your address. If you have any questions, send us a message through our website or email us at customerservice@bullionexchanges.com and we will be happy to assist you. With this purchase, you earn 987 Bullionaire Bucks 987 BB = $0.99. We currently have 21 of this item in stock. For every $1 spend, you will earn 1 Bullionaire Buck which is equivalent to $0.001 off a future purchase. 987 BB = $0.99.